Summertime...'For Sale' signs go up, families move in and out of neighbourhoods, and its a time when homeowners do their outdoor renos like exterior painting. At first I thought…well maybe the home is just a shade of lavender with cream coloured trim and it’s not nearly so bad as she is describing it, or maybe its just some sort of strange undercoating like when they have paint that is treated with a chemical that paints on bright colour so you can see where you are painting but dries white. Sensing the stress I thought I would drop by and see what she was talking about. There it was. Her new neighbours even bought matching plastic chairs and planted coordinating flowers. 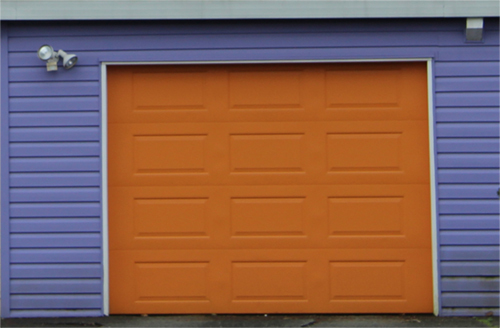 Bright Purple and Bright Orange, this was the colour choice of her new neighbours. I want to highlight the word ‘choice’ because that is pretty much at the core of how local municipalities see the colour of Real Estate. All municipalities in the Greater Vancouver area allow homeowners to paint their house any colour they want. If the property is not being maintained that is another issue, but esthetic choices…well that is subjective as far as municipalities are concerned. The good news is that the colour of your neighbours home does not affect the value of your home. For the homeowner, well they are more likely to have a problem selling their home if they have an unusual colour scheme, but being their neighbour shouldn't affect the value of your home. Unusual colour schemes can affect buyers who are not able to visually look past it and you may have to be a bit flexible with your selling price to compensate for a new paint job. A neutral colour scheme really is best for resell. If your really into colour I always suggest limited any 'bright' colours to doors and trim. Rest assured to any neighbours living beside the home equivalent of a Mondrian painting, unusual colour schemes are more typically found on older homes that have wood siding and siding needs to be painting for upkeep so chances are you'll see a new colour combination at some point in the future. Just cross your fingers that your neighbours get some advice before their second go around with colour. The choice in exterior home colour is not entirely a subjective one, its also ties into the style and age of the home. To me, this is where colour gets interesting because really old homes, as in 'heritage homes' often have dynamic colour combinations that look wonderful, while you could apply the same colour combination on a newer home and it can look pretty bad. 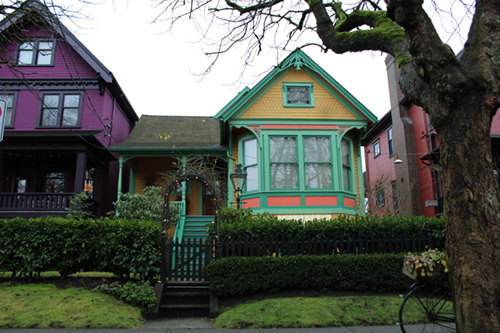 In Vancouver we have a lot of heritage homes and many of them are painted in multiple bright colours...colours that add to their charm. If you happen to have a registered heritage home in Vancouver then you are eligible to obtain a 'True Colours Grant" where you can receive a $1, 000 cash grant and complementary paint to restore the exterior paint colours of your heritage building. As you can see by True Colours Paint Swatch there are some pretty dynamic colours. When I walk around Vancouver, it seems that the older the homes the more you can get away with when it comes to 'wild colours'. I use to live in Ontario in a small town between Hamilton and St. Catherines called Grimsby. It’s not a town that is known for too much but it has an interesting history that relates to some of their heritage homes called “Painted Ladies”, a term first used in San Francisco to describe Victorian and Edwardian homes and buildings painted in three or more colours that embellish or enhance their architectural details. Just a side note for Vancouverties...the Painted ladies of Grimsby sell in the 300 thousand dollar range. 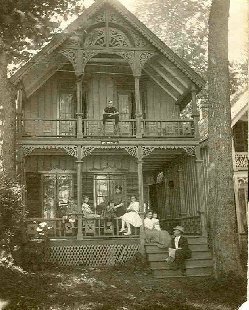 These particular homes were built around 1870 as summer cottages for pilgrims making their yearly summer trip to what is called a Chatauqua. There are still Chatauquas today, mostly in the USA, and they are now more about education and philosophical pursuit than religion. The painted ladies of Grimsby were actually built with bits and pieces of wood including wood taken from old boats and they had a lot of fret work on them which is punctuated by colour as you can see in the photos. Perhaps these pilgrims painted their homes in these bright colours to reflect how they felt--excited, happy, hopeful about the religious revival spirit of the Chatauqua community. As time went on the religious aspect of the meeting place became more known as a beach destination for summer fun. Interesting, the same friend in this story used to go to Grimsby Beach as a teenager in the 1920's and she remembers the painted ladies well. Today, these homes are still there only now they are nestled among newer homes. Its not a beach destination like it used to be and I really only came across the homes when I went on a bike ride with my kids one day. Believe me the sight of seeing those homes after driving my bike through neighbourhoods filled with newer homes was quite a rare find, it soon became our bike trip destination. A couple of weeks after my first phone call from my friend she called me again to tell me that her garbage bins were mysteriously making their way back into her garage…she suspected her new neighbours. The neighbours with the purple and orange house. I asked her 'why do you think they painted their house such an unsual colour? Her answer, they're happy, friendly people and I think they just like to express that with their home. So I guess you never really know…in this case it was less about colour expression and more about expressing the way they felt. Lovely homes!! !Thanks for showing us these pictures. The musings of Vancouver REALTOR® aka Captain Vancouver on Vancouver life, Vancouver neighbourhoods and Vancouver homes.